Embrace is the 3rd highest rated pet insurance company in our list, and easily beat out the bottom 7, but are still a distance away from the #1 and #2 spots. They’ve earned the #3 spot for their high level of customer support, and the reputation that they have earned from other past customers. One downfall that Embrace is facing is the way that they pay out claims. While they state that all claims are paid within 5 to 15 days, it has been reported that you have to go through a bit of a hassle in order to actually get them paid, and Embrace likes to back on and not pay parts of the claim that they originally said they would in your policy. They also fall behind in terms of the technology they use to allow customers to submit claims when compared to the top players in the industry. With all this said, Embrace offers a wellness plan that their major competitors fail to do, so if you are looking to be reimbursed for your pet’s annual visits to the vet, Embrace may be a solid choice. Embraces coverage does become a bit more limited when it comes to older pets, though, so you should keep that in mind if your pet is higher in age. A+ Underwriters: Embrace Pet Insurance uses top rated insurance underwriters from the American Modern Insurance Group for all states, including Washington D.C., and American Southern Home Insurance for policyholders in Florida. Comprehensive Wellness Plan: Embrace covers everything from exam fees and testing, to general, specialist, and emergency care, along with genetic and chronic conditions. You can also be covered for physical therapy, surgeries, cancer treatments, and even euthanasia, cremation, and burial. Deductible Free Wellness Plan: Where Embrace sets themselves apart is in their wellness coverage. Most insurers will take the coverage out of your deductible, and require you to pay out of pocket until the deductible limit is reached. With Embrace, your wellness visits are covered in the policy, requiring no out of pocket expenses. Specialized Customer Care: Embrace has gone to exceptional lengths to ensure their customer service is top-notch in the industry. Embrace utilizes an annual deductible method of counting your claims, so you don’t have to worry about having them denied because you’ve gone over the limits if your pet requires multiple visits for the same condition. As long as you continue paying premiums, Embrace will not impart any lifetime limits on how much coverage you’re able to receive through your policy. While most insurers will deny your claims due to genetic conditions, Embrace will provide coverage for genetic, and hereditary conditions that your pet may be predisposed to having. By paying an additional monthly fee, you can have a rider placed on your policy that offers you anywhere from $250, $450, or $650 of your pet’s annual wellness exams, vaccines, and checkups. With an accident only policy, you can receive coverage for around $20 per month for a 10 year old labrador retriever. If you setup automatic payments for your monthly premiums, Embrace Pet Insurance will give you a 5% discount on your rates. Alternative therapies, such as homeopathic treatment and acupuncture are available through any vet that provides the services. Most pet insurance companies limit this type of coverage to only vets that are members of very specific associations. A lot of pet insurers have issues when it comes to their Better Business Bureau rating. Embrace has a solid reputation of following up with their customers, and properly managing their reputation with the BBB. Embrace has a shorter waiting period that most insurers, but still require you to wait at least 2 days for accident and illness coverage to kick in on new policies. If your pet requires orthopedic treatment, you will be required to wait up to 6 months for treatment coverage to take effect through Embrace. However, through signing an Orthopedic Exam, and going through the waiver process, you can have the waiting period reduced to 14 days. While most insurers will provide you coverage on the prescriptions required by your pet, Embrace is going to charge an extra premium. Pets Age 14 And Older Denied Coverage: If you have an older pet, you are going to have coverage denied due to their age. 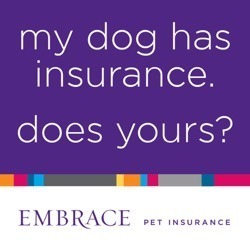 Embrace does not offer coverage to pets 14 years and older. If your pet has existing conditions, you will not be able have them covered under any of Embraces policies. Embrace also does not cover the use of prosthetic limbs, should your pet already have an amputation, or require one while you’re covered through one of their policies. Embrace Pet Insurance is a great company, but there is still a little left to be desired in terms of their coverage, rates, and how they handle paying out claims. Huge perks offered by Embrace are the fact that they do not implement any lifetime coverage limits or per-incident limits, so if your pet requires continuous visits to the vet, you will be taken care of. Embrace also offers wellness coverage that is practically unmatched by other pet insurance companies, and genetic condition coverage that most other insurers will deny claims on. However, paying out claims is where Embrace drops the ball. Even after stating that most claims are paid within 5 to 15 days, they have earned a reputation for backing out on the claim, and not paying for portions of it that were supposed to be covered by your policy. The technology used by Embrace to allow customers to submit claims also falls a bit short, when compared to other insurers on our list. Embrace’s coverage does become a bit more limited when it comes to older pets, though, so you should keep that in mind if your pet is higher in age. Even saying all of this, they are still the #3 spot on our list for a reason. They remain competitive in an ultra-competitive industry and have developed a good customer service reputation, along with a solid standing through the Better business Bureau.